i think once a blue moon mean it barley gets caught or seen! That crab is cool but also gross! I would love to see the crab in person! If I was a crab and I had a choose what color to be I will be green because I will blend in to seaweed. 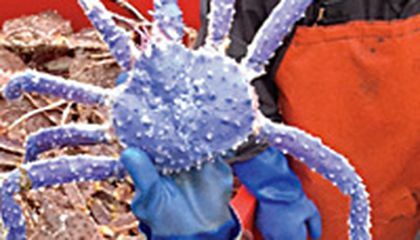 Summary: An unusual blue-colored crab, has been found. The fisherman Frank McFarland found it in his pot on July 4. The strange crustacean is being kept at a Seafood Center and people are showing up to have a photo with the strange crab. 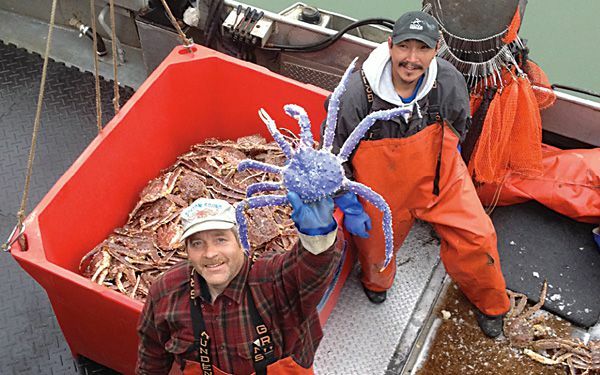 It is a red king crab, that's why the expert Scott Kent cannot understand why it is blue. He thinks it may be a mutation. Kent jokes saying that a blue crab turns up during a blue moon. Comment: Wow! I didn't know that a blue crab was so unusual. Actually, I thought that the same as blue lobsters, blue crabs were more common worldwide. So, maybe, as Scott says, the crab is a mutation or something alike. This article is really worth to read. it means that its very rare. A blue moon happens once a year. Also if I was a crab, I would want to be pink. if i was to be a colored i would want to be a baby blue crab. That would be awesome if you found all types of colored crabs all over the world. The phrase " once in a blue moon " means very rarely. I think it is crazy a blue crab and a blue lobster were caught in the same period of time. Looks like we have some very lucky fisherman. This so crazy. I always thought that king crabs were blue. I have eaten so much king crab and it always tasted so good. It would be so cool to eat a blue crab and sea what it tasts like.